It’s 2 years since I’ve been to Davao and was truly excited when I was invited to join the 2013 Davao Food Appreciation Tour or simply #DFAT2013. 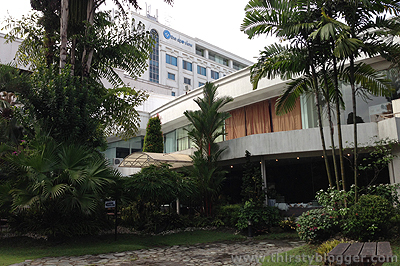 In this post, I’d like to feature where I stayed during the tour – Apo View Hotel. Above is how the room looked like, which is Deluxe Room with two single beds. 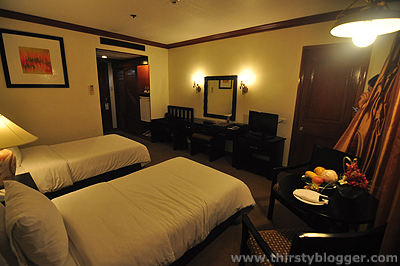 It’s quite comfy in the room, very relaxing and personally, a great option for hotel staycations. 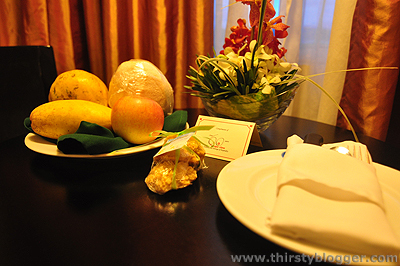 Upon check-in, we were greeted with these complimentary fruits. Great to eat as a midnight snack if you ask me. 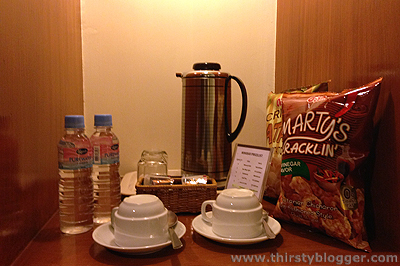 There’s also bottled water, coffee, candies, chocolates and other snacks in and on the mini ref in the room. Our room had free Wi-Fi connection, something that I need as a blogger. 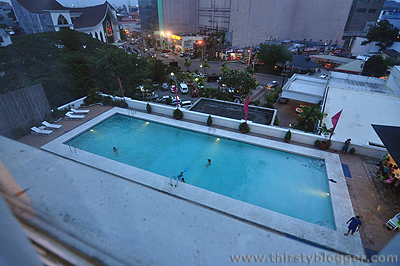 Moreover, our accommodation included a breakfast buffet at Entrée, and access to their pool. Our food tour had a full 3-day itinerary, while I did enjoy their breakfast buffet (sorry, I was too sleepy, too hungry and too lazy to bring a camera in those times); I missed the opportunity to swim in their pool – which is okay because that gives me another reason to come back here. If you didn’t know yet, Davao City has very strict ordinance against smoking cigarettes in public. If you’re a smoker, then you should know that Apo View provides a designated smoking area in their hotel garden. Photo above will be your view while you enjoy your stick. I’d like to thank Apo View Hotel for the hospitality they extended to us. Customer service is great and the room they gave us is very relaxing and comfortable. For those interested, the Apo View Hotel is located at Camus Street, Davao City. You can learn more and receive updates and information on the Apo View Hotel through their website, www.apoview.com.